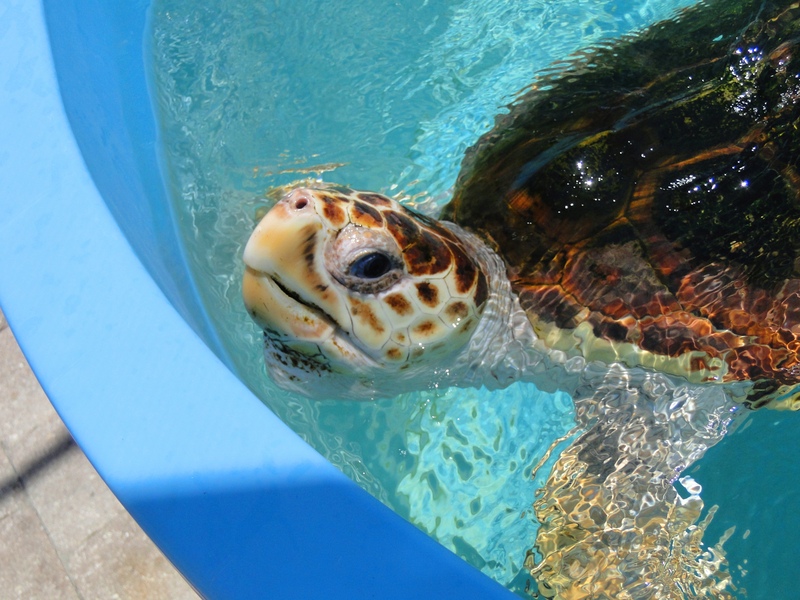 This Loggerhead sea turtle was rescued and being rehabilitated at the Loggerhead Marine Life Center at Juno Beach, FL. Sea turtles are rescued and treated for a variety of issues. Some are sick with a particular infection while others are injured by passing boats or swallow hooks and trash in the ocean. With the publicity and education outreach of ocean and sea life conservationists, many fishermen will come upon an injured sea turtle and bring them in to the center/hospital for rehabilitation. This center and their staff have diagnostic and surgical training, equipment and supplies needed to save lives. The center cares for sea turtles from hatchlings to old, old, old turtles needing assistance. Check out http://www.marinelife.org/ to learn more about their work and how you can help support their efforts.